Bennie Creek is not particularly noteworthy or grand. It does not stand out above all other places in any particular way except that it is very close, and nobody goes there. That makes it really spectacular, in my book. You can spend the day alone, and if you're lucky, only share the whole area with some local golden eagles. The area starts off with access from U89 at the Birdseye LDS Chapel, and the access road is basically threaded through the front yards of local farms and ranches for the first few miles. This is why the trail is so well protected. When it looks like the road is ended, it really makes an abrubt turn to the left in some ranch front driveway, and there is a very unfriendly looking sign posted there that is worth reading once. Drive down a steep grade, where the road turns abruptly back to the west and continues up the mountain. It soon turns to dirt and gravel and then quickly to mostly dirt only. At the Forest Service boundary, it is a very narrow dirt trail. 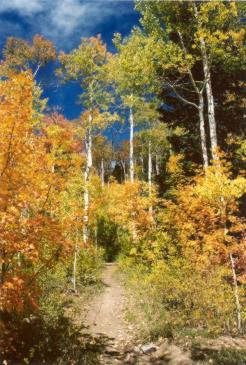 You can drive a short distance further to the trialhead, where oaks and scrub begin to give way aspens and Englemans. Along the way, on the north, you passed a notable junction of "Deer Canyon trail" or some such, that used to fork off to Forest Service treking toward the summit of Loafer Mountain, but it is overgrown and not officially mantained any longer. It is used heavily by the hunting crowd, and incidentally, by great herds of the critters they hunt, both deer and elk, but many great numbers of elk that winter in this area. Many times, I have snowshoed in this canyon, and could not even count the hundreds of head of elk that gather here. Anyway, the Bennie Creek canyon is fun because many springs feed the creek further up, and lush green carpets the floor of the canyon. In fact it is so lush and wet that the trail skirts off to the north side in many places to avoid wet seeps and pools. But these are beautiful areas to explore and splash around, if you don't mind getting your socks wet. The trail ends at the top of a ridge joining with another trail that leads either south toward the highway to Payson lakes, or north to the summit trail complex to Santaquin Peak and Loafer Mountain. You can have a ride pick you up on the road, or turn around here and go back, or hike further to your heart's content. (Important to note for area fishing enthusiasts: If you are rained out, snowed out, skunked out, run off by angry farmers, car broke down, run out of gas and groceries AND powerbait, try drowning some nightcrawlers around the confluence of Thistle and Bennie Creek. The trout are not large, but always hungry. These are wonderful posts. Wish I'd know you somehow when I lived up there in Utah County.